Antonina Zabinski: You can never tell who your enemies are, or who to trust. Maybe that's why I love animals so much. You look in their eyes, and you know exactly what's in their hearts. They're not like people. 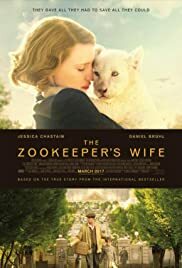 On the very positive side, this drama about Jews hidden in the wreckage of the Warsaw Zoo is based on a true story. Right now, when meanness seems to trump acts of charity and compassion, that's an important message. At the same time, there's quite a bit of déjà vu here, as director Niki Caro fails to plow new ground or to "capture the many layers of this unique story, relying instead on plainly-stated metaphors," said Sheila O'Malley on Rogerebert.com and a contrived and unpersuasive relationship between the main character and "Hitler's zookeeper." Antonina and Jan Zabiński really did save more than three hundred Jews after German bombs and stormtroopers destroyed their zoo. They hid the refugees in their own home, changed their appearance, gave them false papers, and spirited them away, under the enemy's noses. 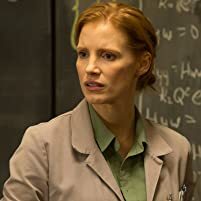 See it for the animals, the fine performance by Jessica Chastain as Antonina, and for the reminder that even in extreme circumstances there are people who believe, as Jan Zabiński said many years later, "If you can save somebody's life, it's your duty to try." Supporting performances are strong as well. Written by Angela Workman. 10 of 54 people found this review helpful. Was this review helpful to you?